Where Should a Dr. Joseph Warren Statue Go? The Lincoln Historical Society has just published Embattled Farmers, a comprehensive study of Lincoln’s Revolutionary War soldiers researched and written by local historian and reenactor Richard C. Wiggin. In his research, Wiggin uncovered 55 new war heroes. He also outed some long-heralded “soldiers,” such as Levi Brooks, who was 12 when the war broke out, and never set foot on Battle Road the fighting on April 19, 1775. Tracing stories like that of Jonathan Gage, a Lincoln soldier held prisoner on a British ship, drew him in, Wiggin said. In his pension records, Gage describes his role in a skirmish, known as Young’s House, in 1780 outside New York City, and states he was never paid for service. Wounded by a sword to the head and a “bayonet to my body,” he nearly died. Such nuggets kept the project rolling. “It brings it out. Now Jonathan Gage is a real person,” said Wiggin, a retired life sciences executive with a fascination for the Revolutionary War. 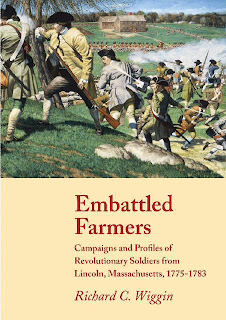 The official launch date of Embattled Farmers: Campaigns and Profiles of Revolutionary Soldiers from Lincoln, Massachusetts, 1775-1783 is, appropriately, on Patriot’s Day. 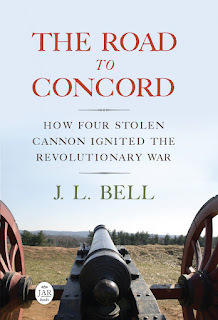 That’s Monday, 15 April, with a reception at the Lincoln Public Library starting at 5:00 P.M.
Rick tells me that all Boston 1775 readers are welcome to that event, and I suspect we’d be especially welcome if we want a copy of the book (592 pages, $30 paperback, $45 hardcover). 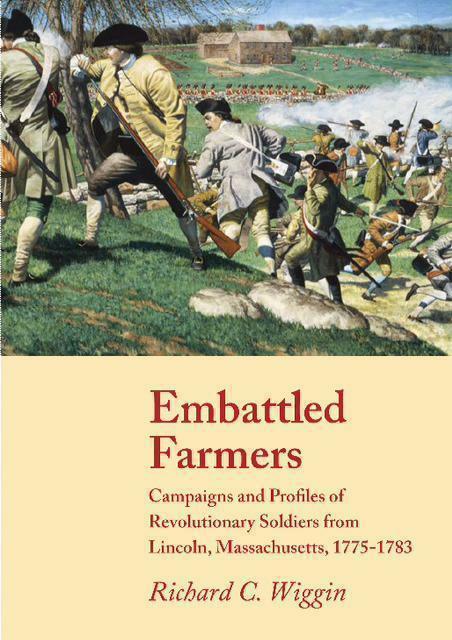 Embattled Farmers is on sale in Lincoln and neighboring towns, including Lexington and Concord, but I don’t have a link for ordering it over the web. Lexington and Concord had better P.R. is all. As an avid family historian with ancestors living through some of these events I find this information to be really fascinating. I think it is great that historians are revisiting historical events and searching for the truth, because I do believe that the true stories are the best!